The leaders who kept us out of the two world wars as long as they did -- did they not serve our nation well, when America's total losses were just over 500,000 dead, compared with the millions other nations lost? 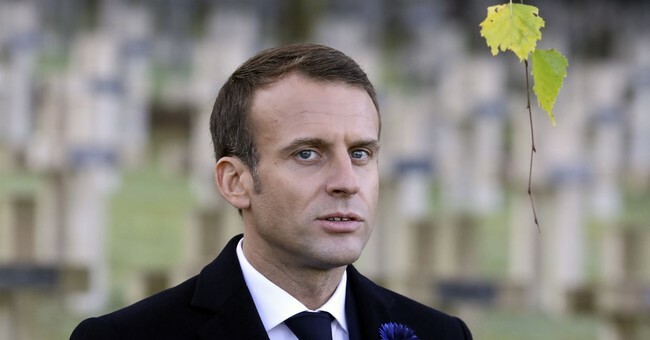 At the Armistice Day ceremony, Macron declared, "By saying we put ourselves first and the others don't matter, we erase what a nation holds dearest ... its moral values." But Trump did not say that other countries don't matter. He only said we should put our own country first. Charles de Gaulle was perhaps the greatest French patriot in the 20th century. Yet he spoke of a Europe of nation-states, built a national nuclear arsenal, ordered NATO out of France in 1966, and, in Montreal in 1967, declared, "Long live a free Quebec" -- inciting French Canadians to rise up against "les Anglo-Saxons" and create their own nation. The realities: In Britain, Scots are seeking secession, and the English have voted to get out of the European Union. Many Basques and Catalans wish to secede from Spain. Czechs and Slovaks have split the blanket and parted ways. The leaders of the world's three greatest military powers -- Trump in the U.S., Vladimir Putin in Russia and Xi Jinping in China -- are all nationalists. Why are we still involved in the half-dozen wars into which Bush II and Barack Obama got us in the Middle East?